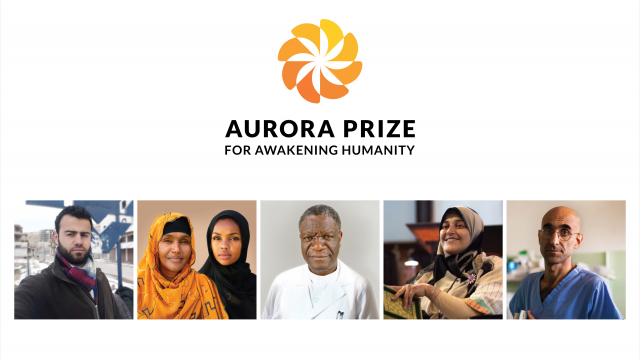 The Selection Committee for the Aurora Prize for Awakening Humanity has today announced the names of the five 2017 finalists who have been chosen for their exceptional impact, courage and commitment to preserving human life and advancing humanitarian causes. Ms. Jamila Afghani, Chairperson of the Noor Educational and Capacity Development Organization, Afghanistan – A polio victim who accidentally received the gift of reading and has dedicated her life to bringing reading and education to girls and women, while enlisting the help of Muslim leaders of faith in her mission. The finalists will be honored at the Aurora Prize Ceremony in Yerevan, Armenia on May 28, 2017 when one will be chosen as the 2017 Aurora Prize Laureate. The Aurora Prize Laureate will receive a grant of US$100,000 to support the continuation of their work, as well as a US$1,000,000 award, which will give them the unique ability to continue the cycle of giving by supporting organizations that have inspired their work. The Selection Committee, co-chaired by Academy Award-winning actor and humanitarian George Clooney, includes Nobel Laureates Oscar Arias, Shirin Ebadi and Leymah Gbowee; former president of Ireland Mary Robinson; human rights activist Hina Jilani; former Foreign Minister of Australia and President Emeritus of the International Crisis Group Gareth Evans; and former president of Mexico Ernesto Zedillo. The Committee shortlisted the five finalists from more than 550 nominations for 254 unique candidates submitted by the general public from 66 countries and in 13 languages. Marguerite Barankitse from Maison Shalom and REMA Hospital in Burundi was named the first Aurora Prize Laureate on April 24, 2016 in Yerevan, Armenia. Following the horrifying experience of being forced to witness the execution of 72 Hutu neighbors whom she tried to hide to keep safe from persecution, Ms. Barankitse, a Tutsi, has spent the last 20 years providing safe haven for orphans and refugees escaping violence and abuse during her country’s civil war. She has rescued and educated roughly 30,000 children, and the hospital she opened in 2008 has treated more than 80,000 patients to date. The Aurora Prize for Awakening Humanity was established in 2015 by the Aurora Humanitarian Initiative on behalf of the survivors of the Armenian Genocide and in gratitude to their saviors. The Aurora Prize will honor an Aurora Laureate each year until 2023, in remembrance of the eight years of the Armenian Genocide (1915 -1923).